If Jeff won the Masters Championship what would he eat? That’s a big IF since he isn’t a professional golfer, although he LOVES golf. It is his favorite hobby and he lives for the big tournament weeks when the TV is glued to the Golf Channel for nonstop coverage. Today is the annual Champions dinner and the winner of the previous year gets to select the menu for the big event. If Jeff were to win in some alternate universe where he was a professional golfer, he would have me cater the affair (another big IF) and he would have me make a couple of his favorite dishes. Here they are along with the recipes. P.S. Don’t you love how I can weave cooking and recipes in with almost any topic?? All roads lead back to food including Magnolia Lane. This isn’t a Napoleon in the traditional sense, which involves pastry and a luscious custard filling, but rather it is a layered salad course. The luscious filling becomes a topping in the form of a garlic aioli and the crunch of the pastry comes from the crispy Sopressata and Parmesan Tuile. It’s Jeff’s favorite salad. For the balsamic reduction, place balsamic vinegar in a small saucepan and bring to a boil. Simmer uncovered until the vinegar has reduced by half. Cool. For the Sopressata Crisps, place on a baking sheet and bake in a 350 degree oven approx. 10 mins or until the salami has crisped up like bacon. Cool. For the Parmesan Tuiles, divide grated parmesan into 4 equal piles on a baking sheet lined with parchment paper. Place in a 350 degree oven for approx. 10-15 mins or until the parmesan has melted and become crispy. Cool. For the Roasted Garlic Aioli, remove any of the outside paper of the garlic as possible. Place on a sheet of aluminum foil and drizzle liberally with olive oil. Seal foil tightly and place on a baking sheet. Bake in a 350 degree oven for approx. 1 hr. Cool. Squeeze all the roasted garlic out of the head into a bowl and combine with the mayonnaise, milk and a pinch of salt and pepper. Chill. For the veggies, season an indoor grill pan with cooking spray. Heat on medium high heat. Grill veggies on both sides to create nice grill marks and season liberally with salt and pepper. To assemble napoleon, place eggplant on the bottom, red onion next, portabella mushroom next and top with the grilled bell peppers. Top each napoleon with about a Tablespoon of the garlic aioli. 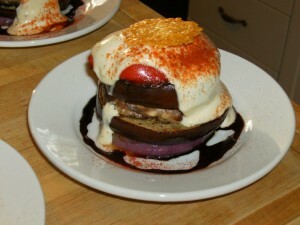 Drizzle the balsamic reduction around the napoleon and garnish with one sopressata crisp and one parmesan tuile. Serve immediately. Heat olive oil and butter over medium high heat in a medium sauté pan until butter has melted. Add onion and sauté until lightly caramelized, approx. 6 mins. Add garlic and heat through until fragrant, approx. 1 min. Add carrot and celery and sauté for a couple minutes or until the vegetables just begin to tenderize. Add beef or veal, pork and pancetta or Canadian bacon and continue to sauté until the meat has completely browned. Season with salt, pepper, red pepper flakes, Italian seasoning and tomato paste. Continue cooking for approx. a minute or two or until the spices have heated through and toasted a bit. Add milk and wine and reduce heat to medium low. Continue to cook uncovered, stirring occasionally for approx. 1 hour or until the sauce has thickened and become rich. Season to taste and add freshly torn basil and chopped parsley. Serve over a bed of pasta noodles, preferably something like a penne or a gemelli with ridges for the sauce to adhere to. Garnish with freshly grated parmigiano reggiano. Dissolve gelatin in boiling water. Allow to sit for 5 minutes to dissolve completely. Place the cream, orange blossom water, vanilla, cinnamon and sugar in a medium saucepan over medium heat. Bring to a boil. Pour in gelatin and whisk well to combine. Allow cream mixture to cool just enough to begin thickening the mixture. Divide the mixture evenly among 8 1-cup ramekins that have been lightly greased with butter. Place ramekins on a baking sheet, cover with another baking sheet and place in the refrigerator for at least 4 hours or up to overnight to set the custards. For the berries, cut the berries in quarters. Sprinkle with sugar and season with vanilla and orange blossom water. Toss well to combine, cover and set aside for an hour. The strawberries will yield some of their own juices, thereby creating a sauce. 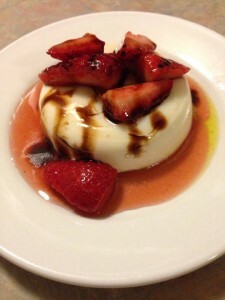 To serve, remove the panna cottas from the refrigerator. Run a paring knife around the edge of the custard to loosen it. Place the ramekin into a bowl of hot water for a few seconds and then turn out onto serving plate. Scoop some of the macerated berries over the panna cotta and garnish with balsamic reduction.